Launch of NASA’s oft-delayed James Webb Space Telescope, the most expensive science spacecraft ever built, will slip at least another 10 months, to March 30, 2021, because of technical issues and management woes, pushing its already astronomical cost up to some $9.66 billion, $837 million higher than earlier estimates, the agency reported Wednesday. In the wake of earlier delays and management problems, both with NASA and its prime contractor Northrup Grumman, a congressionally mandated $8 billion development cost cap was put in place and the latest projected overrun will require NASA to seek re-authorization from lawmakers. Whether JWST, NASA’s flagship science mission, is “too big to fail” or might face increased opposition in Washington is not yet known. The Trump administration has not weighed in other than to continue the project’s funding in its fiscal 2019 budget. Thomas Zurbuchen, director of space science at NASA Headquarters, said congressional reaction to the latest delay was not yet clear, but everyone involved agreed the telescope will produce compelling science. Through March of this year, NASA had spent more than $7.3 billion on the project since it was first proposed in 1995 and was budgeting about $8 billion to complete the observatory and launch it atop a European Space Agency Ariane 5 rocket in May 2020. Another $800 million was earmarked to pay for operations over five years. The James Webb Space Telescope’s optical system and instruments were tested in a giant Apollo-era vacuum chamber late last year at the Johnson Space Center in Houston. To put the projected cost of the JWST in context, the cost of the European Southern Observatory’s Extremely Large Telescope, with a gargantuan 130-foot-wide mirror, the largest in the world, is expected to run around $1.3 billion by the time it goes on line in 2024. The Thirty Meter International Telescope, with a mirror nearly 100 feet across, is expected to cost around $2 billion. NASA managers announced the launch delay and additional costs based on an independent review chaired by Thomas Young, a widely respected aerospace engineer and executive. The panel made more than 30 recommendations, estimated the additional cost at around $1 billion and recommended moving the launch date out to March 2021. “JWST is an observatory with incredible capability, awesome scientific potential and significant complexity, risk and first-time events,” he said. “The complexity and risks cannot be overestimated. In other words, Young said, he is 80 percent confident the observatory can be safely launched by the new target date, but only if NASA follows through and implements all of the panel’s recommendations and only if no other major problems crop up. From the beginning, the enormously complex telescope was a daunting technological challenge for NASA its prime contractor Northrup Grumman, with repeated delays and escalating costs as engineers worked through a steady stream of technical issues and management miscues. Intended to take over from the enormously successful Hubble Space Telescope, JWST is equipped with a 21.3-foot-wide segmented mirror that dwarfs its predecessor’s 7.9-foot one-piece mirror, allowing it to detect infrared light emitted from the very first stars and galaxies to light up in the wake of the big bang 13.8 billion years ago. But unlike Hubble, which was launched into low-Earth orbit by a space shuttle and periodically serviced, upgraded and repaired by spacewalking astronauts, the JWST will be boosted to a point in space known as the sun-Earth Lagrange point No. 2 — L2 — about one million miles from Earth. As such, the JWST will be completely on its own once launched, well beyond the reach of spacewalking astronauts even if piloted spacecraft were available that could reach its remote outpost. And there are no such spacecraft. JWST simply has to work. The observatory’s major elements — the optical system with its mirrors and instruments and the spacecraft “bus” housing computers, propulsion systems, communications gear and other critical systems — are both now at Northrup Grumman’s processing facility in California undergoing tests and integration. Engineers are also integrating the observatory’s sun shade, one of the Webb’s most challenging structures. Folded up for launch, the five-layer sun shield is required to produce the ultra-low temperatures — 50 degrees above absolute zero — that Webb’s sensitive optics and instruments require to capture faint infrared emissions. The layers of the sunshield are stretched out, separated from each other and kept under tension using motor-driven cables. During testing, the cables developed more slack than expected and multiple rips up to four inches long developed in the fabric of the shield. A five-layer sunshield is designed to unfold and stretch out to the size of a tennis court once the James Webb telescope is deployed in space. The shade is required to produce the ultra-low temperatures the telescope needs to detect faint infrared emissions. Fixing the tears and other problems prompted NASA to announced in March that launch would slip from late this year to around May 2019 to give engineers more time to resolve outstanding issues. NASA also announced a series of major management changes, including more hands-on involvement by senior agency personnel, both at agency headquarters and at Northrup Grumman, extensive changes to improve communications across the program and establishment of a standing independent review panel chaired by Young. But additional problems soon developed. During an acoustic test designed to simulate the noise and vibrations the spacecraft will experience during launch, multiple fasteners came loose, producing more than 60 bits of debris in and on the spacecraft. At least two of those have not yet been found. Those problems, oversight issues and others are in the process of being resolved and Stephen Jurczyk, NASA’s deputy administrator, said the agency is now “committed” to a March 30, 2021, launch. But it won’t be easy. And it won’t be cheap. The previously estimated development cost of $8 billion will increase to $8.8 billion. He said no additional money is needed for 2019, but new funding will be required in 2020 and 2021. First proposed in 1995, the Next Generation Space Telescope, as it was then known, was intended to follow in the footsteps of the Hubble Space Telescope, extending astronomers’ reach almost all the way back to the big bang birth of the cosmos. Initially designed with a 13-foot-wide mirror, the new telescope was projected to cost between $500 million and $1 billion. Northrup Grumman was named prime contractor and by 2002, as the design matured and capabilities grew, the projected cost climbed to $2.5 billion with launch expected around 2010. By 2005, the launch date had slipped another two years and the project’s life-cycle costs had climbed another $2 billion to $4.5 billion. Three years after that, a program review put the projected cost at $5 billion and estimated launch in 2014. In 2010, Congress ordered an independent review, which concluded the JWST program had been poorly managed by NASA and would cost at least $6.5 billion to complete. NASA restructured the program and reported to Congress in 2011, the year the spending cap was imposed, that JWST would cost $8.8 billion and that launch would slip to October 2018. But that target date did not hold up. Last year, after the JWST team used up the remaining reserve time built into the schedule to handle unexpected problems, NASA announced launch would slip to the March-June timeframe in 2019. Since then, additional issues came to light, prompting NASA in March to delay launch to the spring of 2020. And now, the spring of 2021. 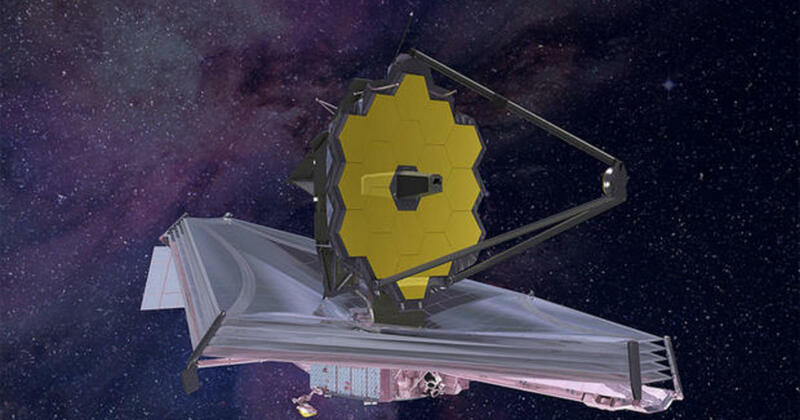 While the projected cost is jaw dropping, technical problems are not unusual in a project of JWST’s size and complexity. Nothing like it has ever been attempted. The telescope features a primary mirror three times wider than Hubble’s to collect and concentrate starlight that will be reflected up to a 2.4-foot-wide secondary mirror that, in turn, will bounce it back down toward the center of the primary where the aft optical assembly protrudes. Light entering the aft assembly will hit yet another mirror that will bounce bounce it back up to a small “steering” mirror. The steerable mirror will, in turn, send the light back down into the Integrated Science Instrument Module, or ISIM, housing the telescope’s four instruments: a near-infrared camera, a near-infrared spectrograph, a mid-infrared instrument and a near infrared imager and spectrograph provided by the Canadian Space Agency. After launch, it will take a full month for the JWST to reach its operational station at the L2 point. Along the way, it will begin unfolding like a huge origami. Two panels of primary mirror segments will deploy to form the full-diameter primary, along with erection of a three-legged mast supporting the secondary. Radiator panels will rotate into place, its main high-gain antenna will deploy and the giant five-layer sunshield will open and stretch into position to shade the optical system. All together, more than 300 mechanical deployments must be carried out compared to about 70 on the Mars Curiosity rover. But managers remain confident the observatory will prove its worth once in space. “It will be worth the wait,” Zurbuchen promised.